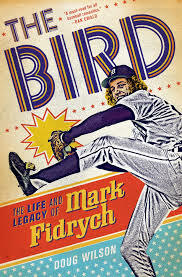 Nobody won last's week's contest, so I'm still trying to give away my extra copy of Doug Wilson's book: "The Bird: The Life and Legacy of Mark Fidrych". Last year, I wrote a review of this book and I still highly recommend it. It is a great read for all Tigers fans whether you remember seeing him pitch or not. How many total bases will Miguel Cabrera get in the Padres series from Friday through Sunday? How many strikeouts will the Tigers pitching staff get in the same series? The winner gets a free copy of the book. Please put your predictions in the comments section. You have until 10:00 PM EST on Friday, April 11 to submit a guess. I will announce the winner once he/she is determined and we'll arrange to get the book sent. The person who won last year's Mark Fidrych book contest is not eligible, but he is free to guess. Miggy will net 7 total bases; the Tigers will strike out 22 Padres. I performed a little self-proctology to come up with those predictions; hope Cabrera pulls out of this slump.